I finally made a chore chart for myself. Don't worry--each day has no more than 3 chores on it, although we all know that I do so much more than what makes it to my list. This is the first week I've been using the chart, so I've been trying extra hard to keep up with all of the daily stuff that needs to happen, like washing dishes, and wiping down countertops, and cleaning up clutter, oh, yeah, and feeding and clothing and bathing the children, in addition to my 3 "extra" chore chart tasks, which are really not extra at all. I have to tell you. I am not cut out for housework. Seriously. I'm exhausted. Now that may have a little something to do with parenting solo this week, but I'm pretty sure it's just because I'm trying to keep up with the housework. And then yesterday, this happened. The picture really doesn't do it justice--it was like a stuffed animal factory exploded in there. And before that there were glue sticks and paper scraps and foam shapes all over the kitchen. And before that it was play-doh and cookie cutters and rolling pins on the table and floor in the dining room and before that it was costumes spread everywhere. is like shoveling the walk before it stops snowing. So true. Unless we're feeling the need for some calming deep muscle input, we wait until it stops snowing to shovel. Because it is pointless to shovel if snow is still falling. And do you know what we do while we're waiting for it to stop snowing? We play. We enjoy the snow. We sled, we throw snowballs, we make snow angels and snowmen, we run around and fall down. We stand with our arms outstretched, our faces lifted to the sky and our mouths wide open to catch the flakes as they fall. My friends, I know that someday the snow will stop falling. Someday my children will stop leaving their stuff everywhere. Someday my dining table will be play-doh free and my living room will not look like an exploded stuffed animal factory. What am I going to do while I'm waiting? I will play. I will enjoy the growing. I will run and jump, I will squish play-doh, I will sit and crawl around on the floor, I will growl and dance and have parades. I will race cars and play football, I will push swings. I will stand in this place with my arms outstretched to embrace the messiness of life with children, with my heart wide open, with my face lifted toward the heavens so I don't miss the blessings as they fall. Because this is holy: these children, this mess, this place in my life is holy. I recently received a copy of A Kingsbury Collection by Karen Kingsbury. This is a collection of three of her earlier novels, Where Yesterday Lives, When Joy Came to Stay, and On Every Side, all in one volume. I jumped at the chance to review this book because I love Karen Kingsbury's novels and I hadn't read any of these. In Where Yesterday Lives we meet the Barrett family of five siblings, who used to be close, but have drifted apart due to circumstance and distance. The novel tells the story of the family rediscovering their love for each other in the week following their father's death. When Joy Came to Stay tackles the subject of severe depression and takes on the foster care system as well. Maggie Stovall is one of those people who seems to have it all together, but she is hiding a secret that threatens to tear her apart. Through her story we learn of the power of God's redeeming love. A beloved statue on public property depicting Jesus is at the center of controversy in On Every Side. Jordan Riley, a human rights attorney who turned his back on God when he lost his mother to death, his sister to the foster system and his best friend to circumstance as a child fights to have the statue removed, but through the fight finds his way back to his childhood faith. I really enjoyed this book. Karen Kingsbury's novels are like Oreo cookies to me. Once I start eating Oreos, it's so hard to stop. And once I start reading a Karen Kingsbury book, it is so hard to stop until the book is done. These were no exception. Her stories are simple and good and they always make me cry because everything always works out the way it ought to--happy endings, always. Life, in Karen's books, is the way that I long for it to be. Karen's faith is woven throughout her work and shines through her characters. God is so present, so close, in Karen's stories--it is a wonderful perspective to see, from the outside, how God is at work in her character's lives, and to imagine that maybe it's not so different for us--that God is at work in our lives as well. Batman is back. And his pants are too long. Either that or his legs are some sort of crazy double-jointed. Which wouldn't surprise me because Batman, well, is a bat. And he brought a shrunken skeleton with him. The skeleton keeps calling me mama for some reason. They went into my bathroom. I'm not sure why, as the only "criminals" in there are the dust bunnies, but I didn't dare point that out to them, since, well, you know, they're kind of fierce. And Batman saw my girly goodies sitting out (oops. Forgot to put 'em away last month) and said, "what are these?" I guess Batman's mom keeps her goodies out of sight more consistently than I. The shrunken skeleton said, "they're diapers." Uh, OK... I made a split second decision not to correct them. I'm quick like that, thinking on my feet and all. How about you? Seen any super heroes or other strange creatures running around lately? You may have noticed that yesterday was Monday. On Monday mornings I help out in MC's classroom, so around 10:03 I got into the big ol' 'burban and started driving toward school. No worries, just an ordinary Monday morning. At about 10:13 (2 minutes before I was supposed to be at school), I looked up and looked around and realized I was going the wrong way! Yes, I was driving toward school, but it was Bubby's school, which happens to be about a 12 minute drive south of our house. MC's school is about a 12 minute drive north of our house. I just had to laugh. I've made wrong turns before because I was preoccupied and put the big ol' 'burban on auto-pilot, so to speak, but I don't think I've ever gone quite that far in the wrong direction because I was distracted. Later, I started thinking. You know, if this had happened a few years ago, I would have been totally beating myself up about it, telling myself that I'm stupid (and worse), and asking myself how I could go so far out of my way without noticing. And don't think that would be the end of it. I would be berating myself for days over this one silly little mistake. Why do we do that? Why are we so quick to judge and find ourselves lacking? Why are we so sure that we don't deserve a little compassion, a little grace? Why do we think we have to be perfect? God is the only One who is qualified to judge us, and you know what? God, through the power of Jesus' blood, has judged us and declared us righteous. Not because of what we do, but because of what Jesus has done. Who are we to question God? A few years ago, I would have been like, well God, He doesn't really know me. 'Cause if He knew, really knew, how horrible I am, what a sinner I am, no way would he call me righteous. And it's true--I'm not. Jesus (who lives in me) is. Instead, I laughed. And that feels so good. To know that, at least on that day, I trusted God enough to rest in His judgement instead of my own. To know, and really believe, that I am enough, I do deserve compassion and grace, and I am righteous in God's sight. And you, my friend? You are too. through the shedding of his blood—to be received by faith. My goodness, it's hard to believe how quickly this year is flying by. It will be Easter in 5 short weeks, so I thought today I'd take you down memory lane to see some of the Easter crafts and activities I've featured in the past. I can't help but be distracted by the lack of snow in this photo compared to the piles we have outside this window today. Can it be that spring is actually coming? That the snow will melt? I guess Easter is about hope and new life, right? You can't really see it in this picture, but the light shines through the cross beautifully, just like Jesus' light can shine through in our lives. You can find instructions for making this Stained-Glass look cross here. I have long been drawn to mosaic as an art form, but interestingly, I haven't actually done it yet. Hmm. Anyway, I just love the symbolism of taking something that's broken and ugly and putting it together in a new way to make something beautiful. It reminds me of the way God works in my life, taking all of the ugly, broken parts of me, parts that I would just as soon throw in the trash, sharp edges and all, and arranges them into a beautiful masterpiece. Click here to learn how to turn broken egg shells into a beautiful mosaic cross. I loved putting this empty tomb set together with my kiddos. Even more, I loved that they could play with it, to tangibly touch and feel and act out the resurrection story as I told it to them. You will find my empty tomb post and the link to the printable here. To me, butterflies are the ultimate symbol of Easter. In a sense, the caterpillar dies in its cocoon and emerges to new life in an amazing and beautiful way as a butterfly. In the same way, through Christ's amazing sacrifice, we can die to our old, sinful selves and emerge to new life in fellowship with God. The directions for this craft are pretty self-evident, but you can click here to read about it if you want to. You can see my fingerprint butterfly life cycle here. While it's not exactly an Easter craft, it could be an excellent tie-in if you decide to explore butterflies in the context of your Easter celebrations. Not only are these Resurrection Rolls ridiculously delicious, they are an excellent way to engage all of your kids' senses in the telling of the Easter story. Find the recipe and explanation here. Resurrection Cookies are another great way to engage your children in understanding the story of Christ's death and resurrection. For the recipe and scriptures to read along with each step, click here. FYI we did end up making these last year and they worked! The cookies were empty! I'm always looking for ways to sneak academic skills practice into our day, and if it involves candy? The kids are all over that. Click here to find some fun jelly bean sorting, sequencing, and graphing activities, along with some free printables. Our egg hunts are generally a bit of a production, sending our children on a treasure hunt involving clues and puzzles and challenges and sometimes even GPS coordinates. A couple of years ago I sent the boys on an Amazing Egg Hunt, modeled after the reality television show, The Amazing Race, and I posted all the nitty gritty details right here for your inspiration. Again with the lack of snow. Seems impossible that we will be seeing grass in just 5 weeks, but yeah, like I said, that's what Easter is all about--believing that God makes the impossible possible. I started babysitting when I was 11 years old. I was 12 when I babysat solo in someone else's house for the first time. It wasn't until years later, when I became a parent, that I came to realize that those parents had to have been either crazy or desperate. I mean, who, in their right mind, would leave their child completely in the care of an 11 or 12 year old? I have been an 11 and a 12 year old, and let me tell you, they don't have the best judgement or decision-making or coping skills. It's not their fault--they just haven't had enough time to practice. Even as an adult I come across situations allthetime that I have no idea what to do with. And children? They're precious. And they depend on us to keep them safe. At the absolute minimum, I decided, babysitters of my children would need to be able to drive or have on-site back-up who could drive. And that has been true for all of these 12 plus years of parenthood. We have never left our children with people who can't drive, except for on-site child care during church events when we never leave the building. We have never left our children in the care of a minor without on-site back-up. The problem with this, of course, is that once teenagers can drive, they can get a real job, and they're not quite as interested in babysitting anymore. It's not even about the driving, really. I mean, having a means of escape in case of emergency is awesome, but... but for me, it's more about the fact that my children are terrors. I love them very, very much, and they're terrific kids, better than most, but they can be horrible, too. And unleashing that on a 12 year old? Yikes. As you may be able to surmise, we don't get away from the kids very often. Now, my friends, I know. I know that those parents were both crazy and desperate. I know because last night, we hired our very own 12 year old babysitter to keep our kids from killing each other while the two of us left to decompress so we wouldn't kill them either. He did a fabulous job. No one was dead or even injured when we returned. MC's Cub Scout Pack's annual Pinewood Derby was this past weekend. Roger's car, "Tiger", won 3rd place in the open class! Notice how he artfully coordinated his outfit with his car. Finally, he has a trophy of his own so he doesn't have to "borrow" from his brothers. It seems like I spend half my time cleaning up the same messes over and over. Messes, I should add, that 90% of the time have nothing to do with me, aside from the fact that apparently I am the only one who is able to see them*. The rest of my time I spend walking around the house turning off lights and flushing toilets. I mean honestly, what in the world do my children have against flushing the toilet? It's not a bad life, it's just...frustrating...disheartening...discouraging...to see my effort undone so quickly, even effortlessly. Curse you, entropy! And friends, I am certain that I could do some amazing things if I didn't have to spend all my time cleaning up messes, turning off lights, and flushing toilets. You know what the problem with cleaning is? Well, aside from the obvious--its never-ending nature? The problem is this: no one notices when something is clean--they only notice when it is dirty. Can I get an amen, sisters? Never, ever in my life have I heard, thanks mom for all the clean clothes in my closet. It's always, moooommmm! Where's my soccer shorts/tie-dye shirt/favorite pants/I don't have any clean underwear. No one ever says, wow mom, the living room floor looks so clean and freshly vacuumed. It's wow mom, there sure is a lot of popcorn on the living room floor. I don't even eat popcorn, so it's definitely not my problem--why are they telling me instead of getting out the vacuum? No one ever comments on how clean the windows are, just how amazing it is that light can still penetrate all the fingerprints and dirt. I recently spent almost an hour scrubbing the fronts and doors of the base cupboards in our kitchen. I wish I was exaggerating on this, but I am totally not. Almost an hour--approximately 7% of my awake time for the day, more time than I spend showering, getting ready in the morning and eating all three of my main meals combined (which, and let's be honest here, is the full extent of my self-care in a typical day)--of scrubbing away drips of who-knows-what that have mysteriously appeared over the 7 years of us living here. And our kitchen isn't even all that big. And do you think anyone noticed? Um, that would be no**. A big fat no-sirree-bob. See what I mean? No one notices clean, but they sure as heck notice dirty. So, why do I do it? Not sure, my friends. I am just not sure. ** Actually, there was someone who noticed--me. I suppose that is why I do it, because I notice. and not merely for people. I have to admit--I am a sucker for children's books. I don't usually buy books because I can borrow them from our library, but children's books are the exception--we have a ton of them. So I was delighted to be given the opportunity to review the newest addition to the God Gave Us series by Lisa Tawn Bergren and illustrated by Laura J. Bryant, God Gave Us Easter. God Gave Us Easter opens with Little Cub and her father dyeing Easter eggs and talking about Easter. Papa Bear explains that Easter is a part of God's plan for each of us, and that ultimately, Easter is about God's love for us. Those who are familiar with Bergren's books about the curious Little Cub and her family will recognize the familiar rhythm of her stories, and delight in Bryant's gorgeous illustrations. It seems like most children's books about Easter fall into one of two categories: books that talk about bunnies and eggs and candy, or books that merely re-tell the story of Christ's passion (along with sometimes creepy pictures--yikes), without really explaining the why of the story. God Gave Us Easter, without re-telling the story, successfully shows the scope of God's plan of salvation in words and with examples that even the youngest listeners can understand. Papa Bear explains that God, not the Easter Bunny, gave us Easter, that eggs are a symbol of new life, that death could not trap God's son, that out of death comes life, that because of Jesus, God forgives us when we make bad choices. Papa Bear talks about forgiveness and redemption, about the flood and how God's children were disobedient, so God needed to find a way to stay connected to his children once and for all. And that's why God gave us Easter. It is so refreshing and lovely to find a book that artfully and naturally flows into a conversation between parent and child about our need for a savior and God's love for us. I whole-heartedly recommend this book to any parent who longs to share the true joy of Easter with their children. For more information, or to read an excerpt, click here. For a FREE printable coloring page, click here. I received this book for free from WaterBrook Multnomah Publishing Group for this review. I was not required to write a positive review. The opinions I have expressed are my own. Did you like this review? Please take a moment to rank it below (please note: if you're reading this via email, you will need to visit my blog to submit your rank). So...did you watch the game yesterday? As you may or may not have gathered, my middle child is a football fiend. Doesn't matter who's playing--if there's a game on, he has to watch it. Don't get me wrong, the rest of us like football, too, but none of us is obsessed the way he is. So I knew we had to watch the game, and I thought it might be fun to make a special treat, so I made these cute little football cake bites (differentiated from cake pops by the marked lack of sticks). Now don't laugh at me and my poor excuse for cake bites! We are just going to eat them, after all--no need for perfection. Or even pretty good-ness. I cannot for the life of me figure out how to 1. get the cake bite off the fork on to the wax paper to harden and cool without gouging the side of the thing (thereby ruining the coating) and 2. how to keep excess chocolate from pooling under the bites. I mean, I would think that a full 180 seconds or so of holding the darn things over the bowl, tapping gently and scraping dripping chocolate away would be enough to avoid that pool. I thought wrong, apparently. Anyway, according to Buffalo Wild Wings, there are 214 days until the next football game. 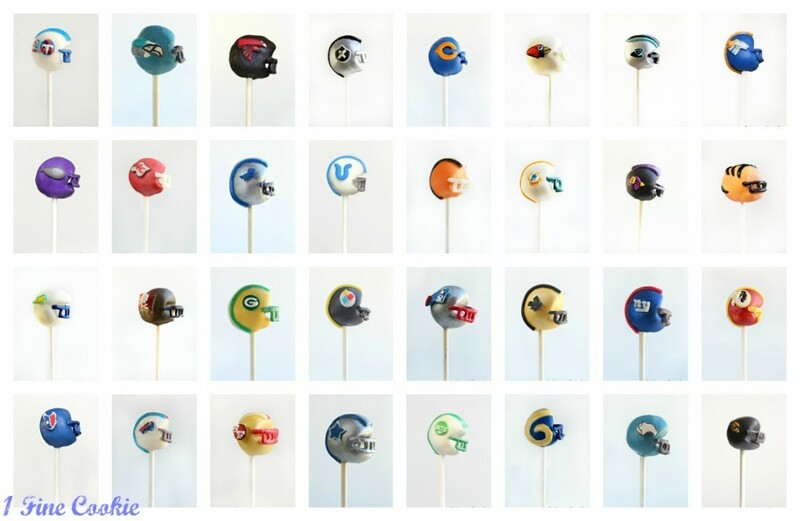 But hey, just in case there's someone in your life as obsessed with football as my little MC, here's how to make your own football cake bites or pops. Follow the basic cake pop instructions from here, except instead of forming balls, make football shapes. Dip in chocolate (I used Wilton's dark chocolate candy melts) and allow to cool. Use white chocolate or candy melts for the laces. I put mine into a ziplock bag with just a tiny hole cut in the corner. You could also use a toothpick or skewer or paintbrush to apply the laces. If you're feeling especially ambitious (and you would have to be, to attempt this, which is why it's a good thing you have 214 days to practice), you could do football helmets like Jasmin at 1 Fine Cookie did. Are these not amazing? Jasmin gives ingredients and instructions to make helmet cake pops for every. single. NFL team. That's 32. Thirty-two! The woman, unlike me, is a cake pop goddess. Happy football cake bite making! First up, this adorable snowman doorhanger (or ornament) inspired by The Happy Home Fairy (click for instructions). A few notes--we used paint dots for the eyes instead of googly eyes and fleece instead of craft foam for the nose--just use whatever orange material you happen to have, even paint would work. Oh, and you certainly don't need a hot glue gun: you can use regular craft or school glue--it'll just take longer to dry. Car got a little crazy with the black paint and painted more than she intended, but I think it turned out super cute--in fact, I liked hers (the one on the left) better than Roger's. Next, we have this sweet torn paper snowman. Just trace a bowl on to a dark background paper (or draw a circle freehand), and use a foam paint brush to spread glue inside the circle. Press torn white paper pieces to the glue and add some black paper eyes, a mouth, and an orange paper carrot nose. So easy and cute, and all that paper tearing is terrific for developing fine motor skills (not to mention this is a perfect way to put to use the fruits of your paper-tearing toddler's obsession). 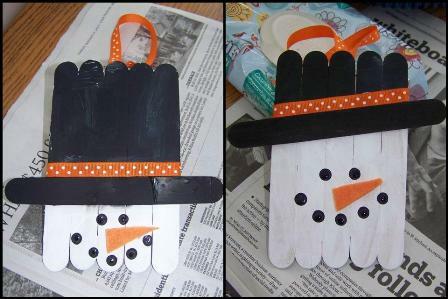 These 2x4 snowmen were one of my all time favorite projects. Isn't this snowglobe snowman cute? Visit No Time for Flashcards to learn how to make your own. I love repurposing trash to make crafts--what could be better than free craft supplies? Use bottlecaps to make this snowman ornament, or turn it into a magnet. Visit She Who Makes for instructions. Oh my goodness! When I learned that this cutie was made out of shaving cream (remember how much fun we had with the shaving cream?) I knew I just had to try it. Unfortunately, Roger made one at preschool and now he doesn't want to make one with me! Learn how to make this Puffy Snowman over at Oopsey Daisy. I'm a sucker for TP roll crafts--again: free craft supplies. 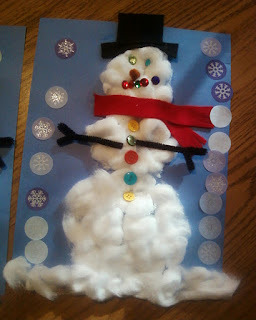 Use cotton balls and some odds and ends to build a snowman while reading There Was a Cold Lady Who Swallowed Some Snow. And finally, I just love these glowing snowmen made out of milk jugs! What a great way to add some light to your porch when it's past the socially acceptable season for Christmas lights (I personally think we should all leave our Christmas lights up and lit at least through the spring equinox--but most people don't agree). Check out the instructions at Stuff by Ash. ...Aaaand...a bonus--not really a craft, but a fun family activity involving snowmen. Why not put together an Snowman Kit (Just Add Snow)? Place a hat, scarf, some buttons or pom poms, rocks, and a (fake) carrot nose in a cute box or drawstring bag. This would make an awesome gift for Christmas or a winter birthday, or you could hide it away for a snow day. Visit Something To Do for an example of what to include.